Father in heaven, you gained St Rita a share in the passion of your Son, and through her sufferings she reached the heights of holiness. Give us courage and strength in time of trial, so that by our patient endurance we may one day share her company in heaven. We ask this through Christ our Lord. I promise to use this favour, when granted, to better my life, to proclaim God's mercy, and to make you widely known and loved for the glory of God our Father. Amen. Heavenly Father, through the intercession of St Rita, help us to know the value of patience in life. Make us grow strong in the spirit of charity and forgiveness. Hear our prayers for all in need; for peace in our own lives and in the world. 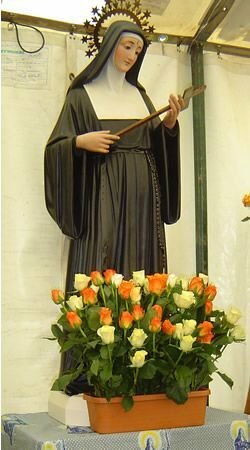 May the example of St Rita inspire in many hearts today a desire to dedicate their lives to God in the religious life and the priesthood. We ask this through Christ our Lord. Glorious St Rita, you who have obtained from the Lord favours which seemed impossible and who have become known as the Advocate of the Helpless.